Why are we rationing water? 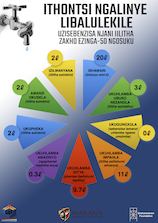 Makhanda is currently using 18 megalitres a day of water each day – about 180 litres per person. 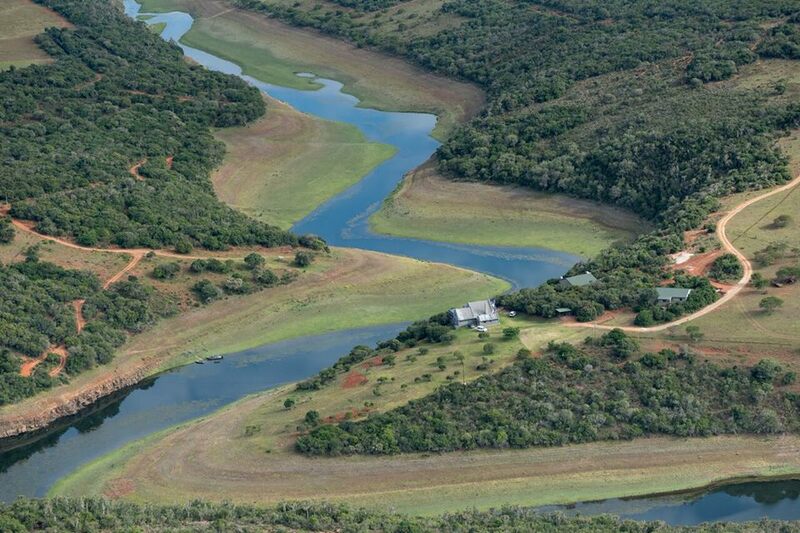 The crippling drought has nearly emptied Settlers’ Dam – which supplies about half of that – and it is unlikely to recover until/unless we receive significant rainfall. And so we are restricting consumption to 50 litres per person a day with immediate effect, to be able to use the Settlers supply for longer and push back the date at which it ceases to be viable. We are also trying to stabilize the output as well as increase the number of town reservoirs filled by the James Kleynhans Purification Works to supply parts of the City immediately, alleviating some pressure on Settlers. 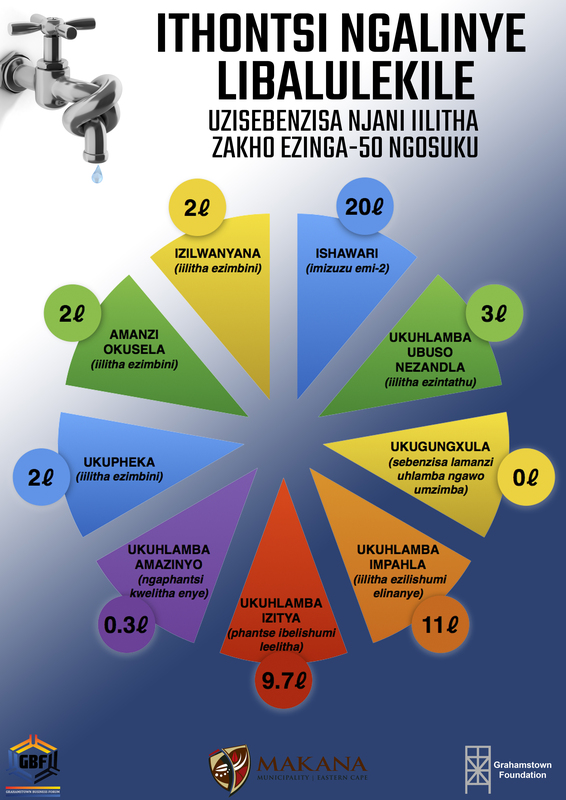 If you would like a more detailed explanation of the water reticulation system in Makhanda, you can download a schematic drawing of the system here (PDF, A3 size). At current levels and usage we anticipate that around the middle of February the supply from Settlers will cease. When that happens, the 10 megalitres of water that is supplied to the City from the James Kleynhans Purification Works will need to be shared by everyone, and a water rationing plan is being developed. What will water rationing be? Current consumption is now being restricted to 50 litres per person per day. In order to eke out the supply from Settler’s Dam for as long as possible to allow sufficient time for the reconfiguration of the water supply system to supply the city’s network from the James Kleynhans Purification Works. When Settlers Dam becomes unviable, management of the supply from James Kleynhans to the system will result in periods where certain parts of the City are shut off from supply completely, as pressure is dropped across the system. At this point water collection points will be established and manual distribution of water will begin. A shut down schedule is being developed to help residents and businesses plan around scheduled outages that take place after the middle of February, and will be shared by Friday 25 January. How will manual distribution work? A distribution schedule is being worked on that will get water tankers delivering drinking water to different wards across the City. There will also be collection points, replenished daily, where residents will be able to collect their daily allocation of water. You will need to provide your own containers to collect a maximum of 25 litres per household per day. What about those who can’t get to collection points? Built into our plan will be plans to deliver water to hospitals, old age homes, clinics and schools. 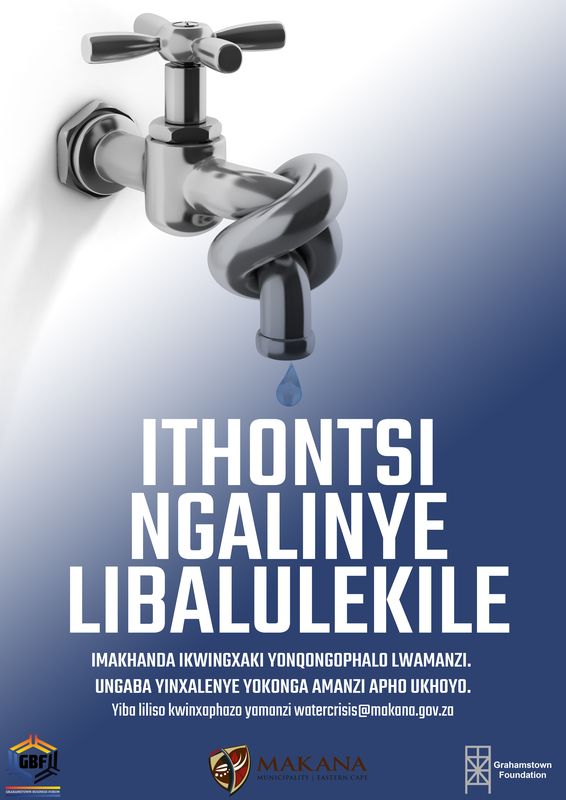 We encourage residents to assist their neighbours with the collection and delivery of water. Should I be stockpiling water? We strongly encourage those who have the resources to do so to harvest rainwater for their own private use and collect from the spring. This will alleviate the pressure on the municipal supply greatly, and will reduce queue times at the collection points. Note, though, that you may not use the Municipal supply to fill your tanks – not only is this illegal it is also unfair on all the other users of the system. If you are aware of anyone doing so, please let us know on watercrisis@makana.gov.za so steps can be taken and fines issued. There are private companies who bring water in from out of town to sell in bulk to homes and businesses should you wish to fill your tanks. We will share their contact details on our website. 50 litres a day doesn’t sound like much. Is it enough? It isn’t very much water but with careful planning and thought it should be possible to get by on that amount. 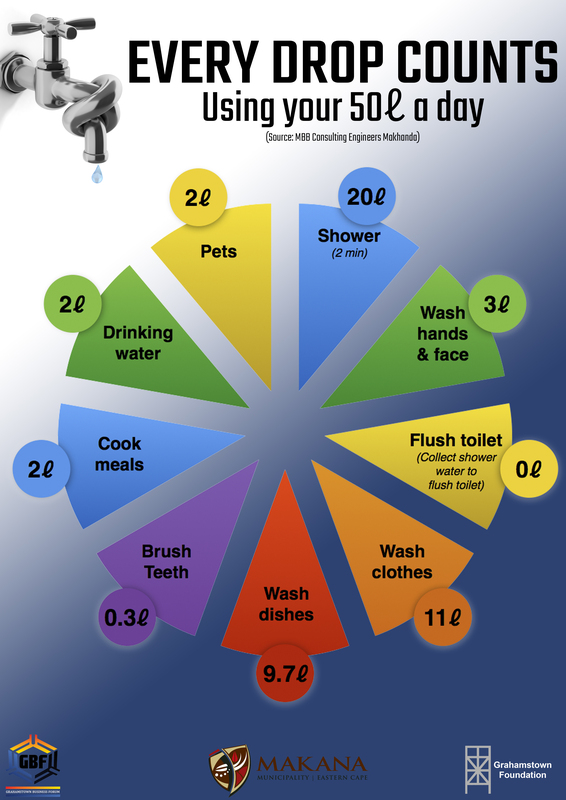 MBB Consulting Engineers have given the following breakdown of typical daily usage to achieve a 50 litre target (click on the image to enlarge it). You can download a high resolution version of this poster to print for home or work, by clicking this link here (English) or this one (isiXhosa). A long-term solution is being implemented that will increase the capacity of the James Kleynhans Purification Works to meet the whole City’s needs, drawing water from the Orange and Fish Rivers. This upgrade will cost R170m and is due to be online in June 2021. We are working with the National Departments of Water and Sanitation, and of Cooperative Governance as well as the Municipal Infrastructure Support Agency to implement this plan. Meanwhile we need to manage the supply that we do have. If we get high rainfall in the Settlers catchment area this year it will bring some relief, but that is unpredictable and our planning can’t rely on this. No. Many media reports are using the phrase ‘Day Zero’ incorrectly. The phrase came into common usage in Cape Town when there was a risk that the entire supply to the City would dry up. In our case – if we manage our water rations and the infrastructure well – we will have a drastically reduced and occasionally erratic supply, but it is unlikely to dry up completely. There are plenty of resources available that offer good water saving tips. We will share these tips and resources on our website. 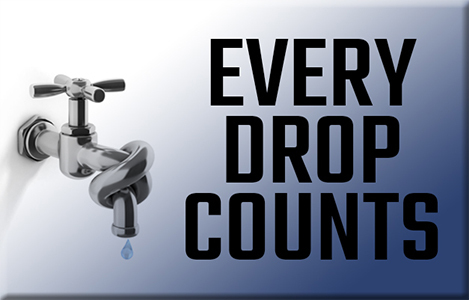 We strongly encourage everyone to harvest grey water from their sinks and showers to use in their toilet cisterns and gardens. Every time you flush you use 12 litres a day – or a quarter of your daily allocation. A three-minute shower can use your entire daily allocation. Why are there so many leaks in the system? Apart from the ageing infrastructure which needs attention, turning water supply on and off results in unnatural pressure in the system and, inevitably, leaks and burst pipes will occur. Our team will respond as quickly as possible to reports of leaks to effect repairs. How do I report leaks if I see them? MobiSam is a very effective tool for managing the logging of water issues and our teams use it constantly to monitor the situation and respond to issues. So you can log the issue there or, if you don’t have access to MobiSam please email details of the leak to watercrisis@makana.gov.za and we will pass it on to the team on the ground to manage. What do I do if I see someone using more water than they should? We will only get through this crisis if everyone works together and does their bit. Unfortunately there will always be some people who ignore the crisis and carry on as if nothing has changed – washing cars, watering gardens, filling tanks and swimming pools. While the Municipality can (and will) respond when we are alerted to such behavior, obviously we would rather use our scarce resources to manage the crisis and would prefer it if residents and businesses behave responsibly. 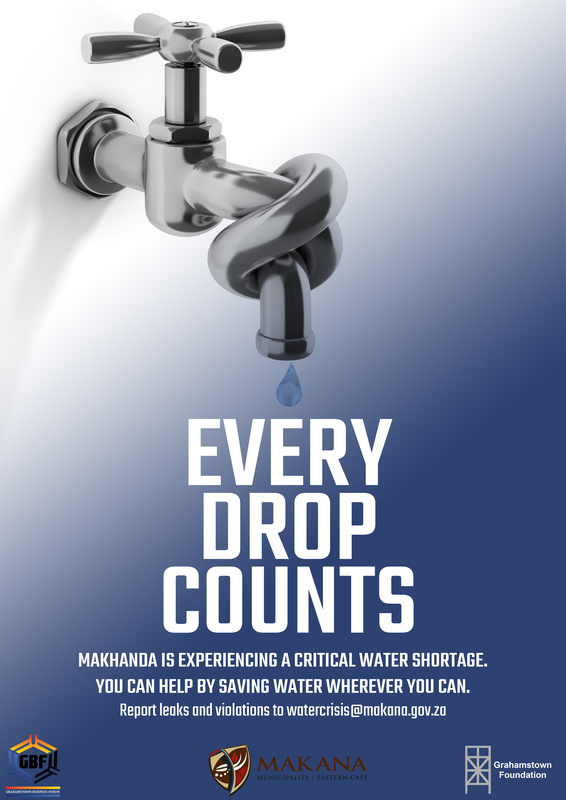 If you see someone wasting water please let us know by email watercrisis@makana.gov.za with as much information as possible and we will take the matter forward. Who is managing the crisis? Makana Municipality have pulled together a coalition of individuals and organisation spanning our city. At a high level, we are engaging with National and Provincial government to discuss relief efforts as well as long-term solutions, while simultaneously we are partnering with our community to galvanise a response to the immediate crisis we face. We have established an emergency response team that includes all Municipal departments, Rhodes, the National Arts Festival and Grahamstown Foundation, local and national disaster management personnel and others. This team is helping with communication, planning and execution of our management plans. We have also contracted MBB Consulting Engineers to ensure the stability and efficiency of our water supply infastructure, and they are working closely with the Municipal water department to manage the situation on an ongoing basis. How are we going to handle big influxes of visitors to our City – during Scifest, Festival, Rhodes graduation and school events? Those are all important events for Makhanda and will go ahead. Apart from the plans in place to deal with the immediate crisis, we are working with all of our big institutions to prepare plans to reduce their impact on the Municipal water supply and to ensure that they can go ahead with as little disruption and inconvenience as possible. 4/4 by the latest Tuesday. Once power is restored Howisons will run at full capacity but the system may take some time to refill over night. 2/4 The Municipality is using water tankers to deliver water, drawn from the West water supply, to Grahamstown East. The essential maintenance by Eskom between 6 and 6 today means that water cannot be pumped or purified at Howisons Poort. 1/4 To all residents on the Western Side. For the past 3 days we have not been able to pump water from the James Kleynhans Water Works due to high turbidity of water that was released from the Glen Melville Dam from the Fish River Scheme.